“We have always held to the hope, the belief, the conviction that there is a better life, a better world, beyond the horizon”, Franklin D Roosevelt once said. And fair enough. It’s a noble aspiration. But it should be noted that the great man expired well before he met the fiscal debate of Australia Votes 2019, much of whose principal subject matter is so far over the reasonably foreseeable economic horizon that we can barely see the soles of its boots. Perhaps you are among the voters who — notwithstanding the comparative youth of the campaign at just one week old — are already suffering debilitating signs of billionitis. The symptoms of billionitis are very similar to those of its better-known cousin, tinnitus: ringing in the ears, inability to concentrate, a furious urge to throw things. It is caused when two political parties — finding themselves underwhelmed by the moribund budgetary environment in which they presently find themselves — abandon the fiscal shallows of today for the inviting depths of the mid-to-late 2020s, where imaginations can afford to run wild. Here, in the safety of the future, a campaigning leader can sensationally offer many billions of dollars of spending on nice-sounding things like tax cuts and smooth new highways and fast trains and curing cancer. (Take the recent budget! As Shane Wright points out today, of the $30 billion promised in infrastructure spending, only 30 per cent of it happens in the next four years; the bulk is two elections away, presumably to be delivered by the second Bert Van Manen government as the next decade eases toward its close). Billions in the future are easy to commit, especially when the present is a bit ticklish. And when your opponent does not immediately agree, then it’s on with Part B: accusing that opponent of “ripping billions off” either 2024-era cancer patients who haven’t even GOT cancer yet, or hardworking 2029-era taxpayers who are yet to get a paper round. Why is this uniquely enraging to the billionitis sufferer? The likelihood of ANY of these plans being blown horribly off course by unrelated events? In the next financial year alone, nearly a third of the projected surplus is attributable to the collapse of a tailings dam at the Corrego do Feijao mine in Brazil, cruelling iron ore supply from that country and driving world iron ore prices higher, generating more company tax for the Australian federal budget. Of the surpluses projected for the next four years — totalling $42 million — no less than $27 million is accounted for by “parameter variations”, which is economist-speak for “we have a definite hunch that we will be spending less on stuff like welfare by then, because everything is going to be appreciably more awesome”. Late last week, the Coalition kicked off its accusation that “the total of Labor’s new taxes is $387 billion over the decade“. And yes. That does sound like rather a lot. But it’s a classic “pin the tail on MY donkey” exercise. 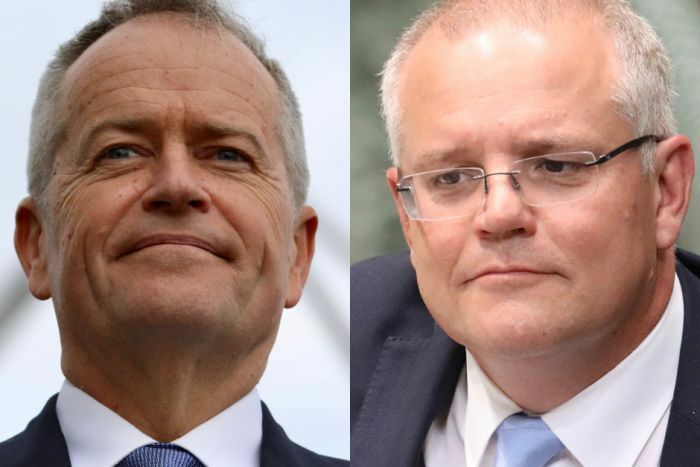 Of the $387 billion in “new taxes”, approximately $230 billion is Labor’s refusal to sign up to the over-the-horizon schedule of tax cuts the Coalition has unveiled in a last-minute attempt to look permanent. And this is not a partisan remark. Labor’s accusations that the Coalition will “rip billions” out of the health budget are based on its own optimistic decade-long projections posted in 2013, the last time it found itself in an eleventh-hour construction blitz of castles in the sky. When you are posting your last budget before what feels like is going to be an electoral defeat, you can afford to be visionary. Paint a decade of expenditure just the way YOU like it! That way if you lose, you can spend the next few years accusing your successor of dismantling a noble vision of reform. And if you win, the horror of actually having to try and make it your projections come true is at least sweetened by your unlikely victory. Don’t be distracted by the billions. There are decisions to be made at this election, and they are simple; simpler, indeed, than they’ve been for a long time. Are you a subscriber to the idea that if you cut taxes, you free the economy to grow and everyone benefits in the end? Or would you rather see higher tax rates and the proceeds spent on public services? That’s the choice. It’s the choice now, and it’ll shape your life in 10 years’ time. Just don’t expect the billions to add up exactly the way it’s claimed they will today.